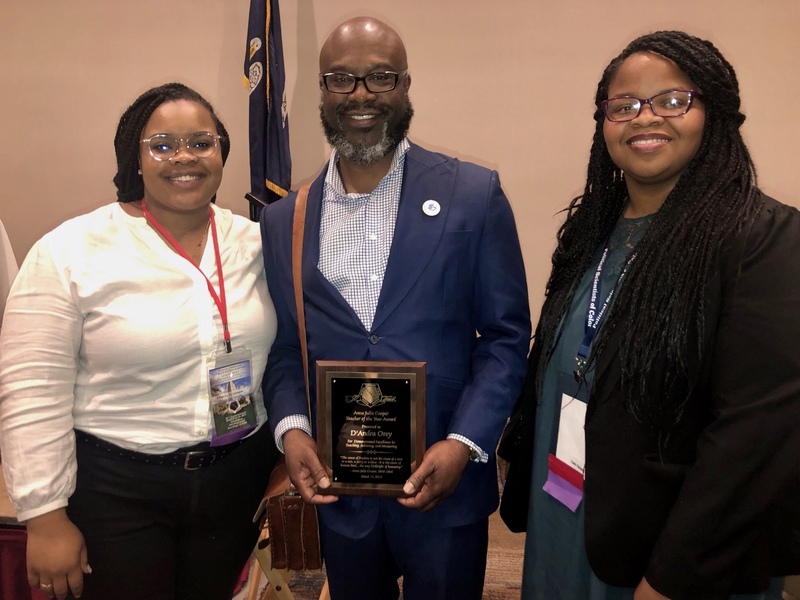 Dr. D’Andra Orey, professor of political science, received the Anna Julia Cooper Teacher of the Year Award on Friday, March 15, 2019, at the 50th Anniversary of the National Conference of Black Political Science Associations annual meeting in Baton Rouge, LA. Orey was nominated for the award by a former student. Kesicia Dickinson, a former student of Orey’s who is currently pursuing her doctorate at Michigan State University, described the professor as a “selfless instructor and mentor” committed to student success. “Dr. Orey played a vital role in my development throughout my undergraduate career and strongly influenced my decision to pursue a political science doctoral degree,” said Dickinson in a letter of support to members of the selection committee. 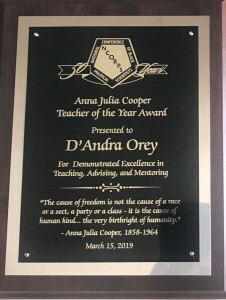 The Anna Julia Cooper Award is named after Dr. Anna Julia Cooper, administrator, and teacher of the M Street School and founder of the Frelinghuysen University for adult education in Washington D.C. Although Cooper was born into a condition of enslavement, she eventually received a bachelors and masters in mathematics and her Ph.D. in French from the University of Paris more commonly known as the Sorbonne. Orey expressed that it is not him but the students who go the extra mile to achieve their goals. “So, in many ways, I think the students are more deserving of this award than I am,” he said. Once a student with a 2.62 GPA, Orey said he lives vicariously through his pupils. “I think that is why I am so hard on some students because they reminded me of myself when I did not apply myself. Students really respond when they know that you care. As the adage goes, ‘People do not care how much you know until they know how much you care,’” he said. Jasmine King, a junior political science major, is one of two JSU student fellows in the Mary Ellen Pleasant Entrepreneur Fellowship program supported by the Bill and Melinda Gates Foundation. A member of Orey’s student-led research team, King said she gained first-hand experience that she believes cannot be found on any other college campus. “Dr. Orey’s dedication to the development of his research team allowed for each member to be pushed to unimaginable limits and inspired creativity geared toward problem-solving amongst each of us,” she said. According to the organization’s website, the National Conference of Black Political Scientists was established in April 1969, by approximately thirty-five black political scientists gathered at Southern University in Baton Rouge, Louisiana to discuss the problems faced by persons teaching political science at historically black colleges and universities. The group reconvened in September of that year at the Annual Meeting of the American Political Science Association in New York. It was the consensus of this now broader group that the problems facing black political scientists, independent of their geographical location or institution, were sufficiently similar to warrant establishment of a national organization. Consequently, the persons present at this September 1969 meeting voted to establish themselves as the National Conference of Black Political Scientists. The organization’s first Annual Meeting was held in May 1970, at Atlanta University in Atlanta.